Military robots enjoyed a big week, as two prototypes—one for the air and one for the land—made impressive debuts. We’ll look at both in this video report. First up, an airplane piloted by nothing more than a computer was able to successfully land on an aircraft carrier off the coast of Virginia. It’s the first time a jet-sized drone has made what’s called an arrested landing at sea. 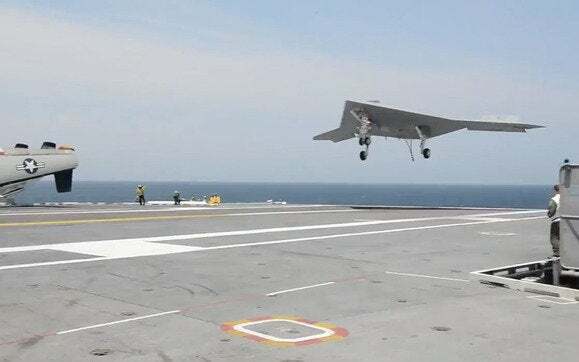 This airplane, piloted by nothing more than a computer, successfully landed on USS George HW Bush off the coast of Virginia. Meanwhile on land, Atlas is a 6-foot-2-inch, 330-pound humanoid robot built by defense contractor Boston Dynamics. 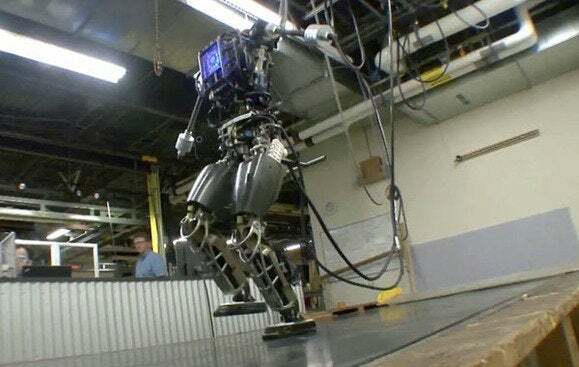 Teams competing in the DARPA Robotics challenge will have until December to teach Atlas the moves it might need to perform in a disaster response scenario. Atlas has an onboard computer that controls all of its actions, and 28 hydraulically-actuated joints allow the robot to move in a near human-like fashion. Atlas goes for a stroll. The goal of the DARPA Robotics Challenge is to generate research and development so that robots can work alongside humans to reduce casualties, avoid destruction and save lives.